Shimmering Skin Perfector Moonstone Spotlight: Water, Glycerin, Ethylhexyl Methoxycinnamate, Homosalate, Glyceryl Stearate, Octyldodecanol, Butyl Methoxydibenzoylmethane (Avobenzone), Hydrogenated Polyisobutene, Trilaureth-4 Phosphate, Propylene Glycol, Hexylene Glycol, Cetyl Alcohol, Hamamelis Virginiana Witch (Hamamelis Virginiana (Witch Hazel) Water), Persea Gratissima (Avocado) Oil, Ceteareth-12, Ceteareth-20, Phenoxyethanol, Triethanolamine, Carbomer, Paraffinum Liquidum/mineral Oil/huile Minerale, Glucose, Fructose, Methylparaben, Ethylparaben, Propylparaben, Alcohol Denat, Dextrin, Sucrose, Urea, Propylparaben, Bht, Hexyl Nicotinate, Glutamic Acide, Aspartic Acid, Alanine, Aloe Barbadensis Extract (Aloe Barbadensis Leaf Extract), Butylparaben, Fragrance. May Contain [+/-]: Titanium Dioxide (Ci 77891), Iron Oxides (Ci 77491, Ci 77499), Tin Oxide, Mica. Shimmering Skin Perfector Moonstone Pressed: Talc, Caprylic/capric Triglyceride, Isostearyl Alcohol, Petrolatum, Silica, Boron Nitride, Nylon-12, Hdi/trimethylol Hexyllactone Crosspolymer, Cera Microcristallina/ Microcrystalline Wax/cire Microcrystalline, Dimethicone, Acrylates Copolymer, Polyethylene Terephthalate, Synthetic Fluorphlogopite, Calcium Sodium Borosilicate, Calcium Aluminum Borosilicate, Tin Oxide, Sorbitan Sesquioleate, Paraffin, Magnesium Stearate, Polyethylene, Tetrasodium Edta, Potassium Sorbate, Chlorphenesin, Mica, Titanium Dioxide (Ci 77891), Iron Oxides (Ci 77491, Ci 77492, Ci 77499), Manganese Violet (Ci 77742). 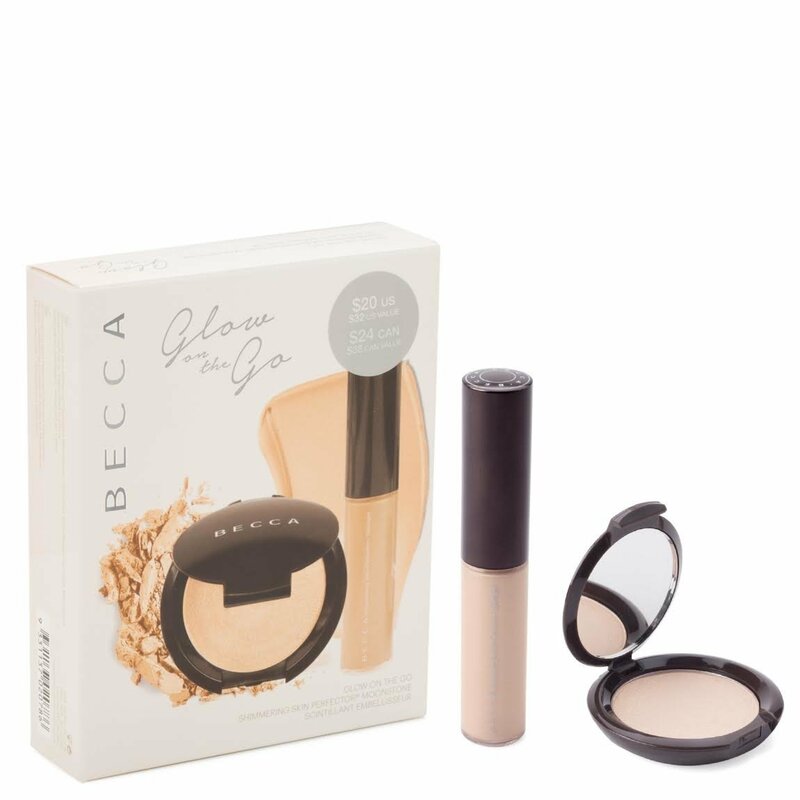 Get the iconic BECCA glow wherever you go with this set of two mini highlighters in Moonstone, the best-selling pale, incandescent gold shade. Designed for targeted highlighting, all-over radiance, and touch-ups, these travel-friendly powder, and liquid luminizers fit perfectly inside your party clutch. With a brush, dust Shimmering Skin Perfector Pressed along the cheekbones, bridge of the nose, and chin. Use the Shimmering Skin Perfector Spotlight Wand to add extra luminosity to targeted areas, like the brow bones, temples, and cupid’s bow. Dab to blend. You can also mix Shimmering Skin Perfector Spotlight Wand with primer, foundation, or moisturizer for added radiance. I am very used to using SUPER BLINDING, super pigmented, cyborg/alien like highlighters that I'm pretty sure you can see from space. Soooooo I figured let me get one to tone it down a bit for those days I just want to look like I'm lit from within with a more "natural" highlight. 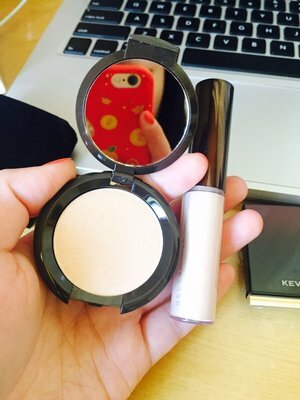 I have always heard great thing about Becca (obviously) so this little "sample" pack was perfect for me. It may be called a kind of sample pack but trust me it will last a long time. It's a gorgeous highlight, not too much and not barely there either. Overall I'm very pleased with these products. I would love to try Pearl next! Great buy! I've repurchased this product multiple times in both the sample and full size. It is hands down my go to highlighter! Easy to blend and doesn't clump up like some shimmer highlighters do. I'd definitely recommend, you'll get so many compliments! I'm so happy to have it! Just amazing! !This highlighter is incredibly!Love this glow!I will continue to buy this no matter what! Achieve a perfectly highlighted complexion with the set. Follow with foundation and add Moonstone,Shimmering Skin Perfector on the cheekbone brow bones, temples and bridge of the nose, create a long-lasting dewy finish.The mini travel size easy to take while on a trip. Like most said, it's travel size, but not as tiny as I expected. Overall, it's a very good product. The liquid especially is pigmented & happens to be my favorite, while the powder highlighter is more of a subtler, natural glow. This set is amazing. Moonstone is the perfect color. The cream gives a glossy natural glow while the powder takes it a step further.